A purchasing cooperative or network is a joint arrangement among businesses and/or governing agencies that agree to accumulate there overall demand in order to receive lower prices from selected suppliers. In other words, a group of businesses agree to combine their buying power and source from a select group of suppliers. The suppliers are guaranteed business but the purchasing cooperative are able to negotiate significantly reduced rates from said vendors. Purchasing Cooperatives are used frequently by municipalities, schools, and public agencies since they are required to follow laws that mandate competitive bidding. Counties, municipalities, schools, colleges and universities in most states can legally enter a purchasing cooperative that allows them to legally use a contract that was procured by another governmental entity. An example of this is Harris County Department of Education who has created three separate purchasing cooperatives that manage the needs of their entire district and offers more than 275 vendor contracts. to meet government purchasing requirements. 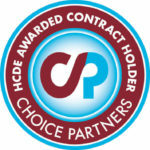 The team at Choice Partners complete a legal, competitively bid government procurement process so their members can act immediately to access the contract they need, saving time and money on the bidding process and purchase. Members enjoy free membership and gain immediate access to vendors, contracts and shared service solutions from the purchasing cooperative of Harris County Department of Education.